Disclosure: Thank you to Kristian Regale for sending us free juice in exchange for this review. I had previously read other reviews on these juices, and I knew from the rave reviews I saw, that these were something I had to try! Kristian Regale sent us a case of the juices to try. The first thing I noticed that I thought was cool, was that they come in bottles that look like wine bottles. Rest assured, these juices are alcohol free. Just pure, all natural delicious sparking juices! The peach was a hit at our house right off the bat. My nieces and nephew were really wanting to try uncle Jake's product - they begged me all night. I finally gave in and before we knew it, the Peach was all gone. They were begging for more and I didn't have but that one bottle, so we tried other flavors! They also loved the Pomegranate Apple flavor. I loved the Peach as well, but knew I had to try all the other delicious flavors. The apple was so good! I opened the Pear sparkling juice and enjoyed the whole bottle by myself throughout the week. The Black Currant, my girlfriend really enjoyed. I literally shared with everyone! This product is delicious, and I would definitely purchase these juices in the future. These would be great to have at a wedding dinner, or any kind of get together. Written by Jake; a new contributor for Rats and More. Disclosure: We received Kristian Regale products for free, in exchange for this review. All opinions expressed within this post are our own, and were not influenced in any way. Must be 18 years or older to enter. Open to US only, No P.O. Boxes. NO PURCHASE NECESSARY. This giveaway starts on September 18th, 2013, and will end on October 1st, 2013 . Winner will be drawn via Random.org via Rafflecopter, and announced on top of the Rafflecopter form, as well as on the top "Winners" page. The winner will be emailed and will have 48 hours to respond to my email before a new winner will have to be drawn. If you're tweeting for entries, you must have an "unlocked" account. The number of entries received determines the odds of winning. VOID WHERE PROHIBITED BY LAW. I really want to try the apple or pear. I'd like to try the Peach flavor the most. Would like to try the pear one. I want the pomegranate and apple. I would love to try the black currant! I want to try the Pear! 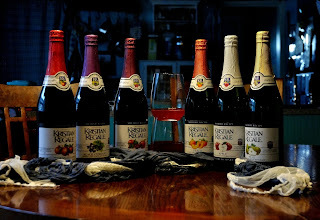 I would love to try the Apple and Peach flavors of Kristian Regale Juices! I'd like to try the Pear. I'd most like to try Lite Pear. Thanks. Halloween $500 GC Event (FREE) for Bloggers!